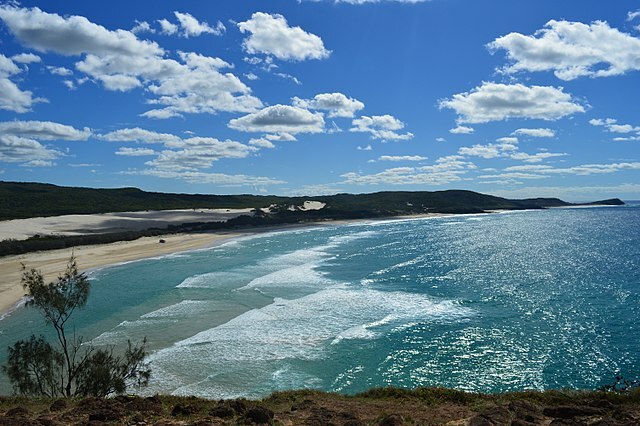 Fraser Island is the largest sand island in the world as it measures 120 km by 15 km. It covers a total area of 1840 square kilometers. It is also the only place in the entire world where the rainforest grows on sand. It was formed during the Ice Age from sand drifting off the east coast of mainland Australia. The island has a maximum elevation of 244 meters. It has more than 100 freshwater lakes that you can swim in. In 1992, it was designated as a World Heritage Site by UNESCO. Fraser Island was named after a Scottish woman named Eliza Fraser who survived a famous shipwreck of the coast of Queensland back in 1836. This island is home to several other attractions including Champagne Pools, Eli Creek and Lake Birabeen. There are massive sand dunes spread out all over this island. The biggest of all of them is 244 meters high. This island has many perched lakes. Lake Boomanjin is the largest of lake and it covers over 200 hectares. The indigenous name of the island is K’gari which means paradise. It is home to more than 230 species of bird including pelicans, ospreys, kingfishers, peregrine falcons and the ground parrot. The island has plenty of Eucalyptus trees that also make it very smelling but in a nice way. The island has been inhabited for at least 5,000 years. Currently, less than 400 people live here. It has also served as a secret training base for allied soldiers during World War II.